If you’ve been reading the Daily Deac for some time, you know I am in grad school right now, and part of our curriculum has been about research methods and surveys. Surveys are fantastic…if you get enough people to answer them (so you can have a meaningful sample size). This week’s Message for First Year Families is on Health and Wellbeing. Visit the web page to see it (and past messages). Also, registration for spring classes is beginning this week. Please be sure your Deacs check their holds and registration status before trying to register. If a student has a hold, he/she will not be able to register – and they do not want to find this out 5 minutes before their registration time. They need to look a couple days before registration (and ideally the morning of) to make sure they have time to clear their holds (as they need to clear them during normal business hours). Login to your WIN account. Select Check Your Holds & Registration Status and view your holds. In a perfect world, your Deac sees see green checks in the holds section saying everything is ok. If they see a red X, they need to get that cleared before they can register. Here is some information about registration support being offered to students (particularly first-year students). Registration Assistance: OAA staff will provide registration assistance to first-year students from 5:00 – 9:00 pm on Thursday, November 8 and Thursday, November 15, 2018 in Babcock and Angelou Residence Halls, respectively by week. Office of the University Registrar staff members will be available in the evenings of Monday, November 5 through Thursday, November 8, 2018 and Monday, November 12 through Thursday, November 15, 2018 during registration rounds to answer student questions using Google Chat. Open-Course Report: The Open Course Report, an easy-to-read listing of spring courses with open seats, will be posted on the OAA website and on the OAA Facebook page following registration (by the end of Monday, November 12, 2018). This report will be updated periodically through the beginning of the spring semester. Finally, tomorrow is election day. We can agree or disagree on who are the best candidates, but I hope we all agree that it is a privilege to be able to vote. 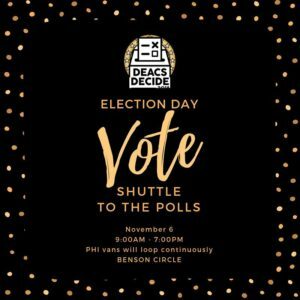 If your Deacs are registered in NC and need a ride to the polls, we have them covered.